The K-RACK Kayak loader is an affordable, clever system that has been designed to help you load and unload your kayak effortlessly. Suitable for most kayaks & Canoes. Including Sea Kayaks, Fishing Kayaks and Recreational Sit On top Kayaks. Small enough to stow in the vehicle permanently when not in use… keep it where you need it, when you need it! 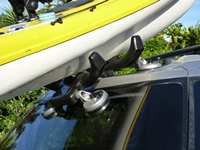 Sold as a pair, the molded cradles on the K-RACK have been designed to accommodate most hull shapes, guiding them onto and off the roof racks with ease. Each K-RACK comes with two suction cups which offer a secure mount when fitted correctly. Load & unload without risk of damaging your kayak or vehicle. Sea Kayaks Suited to all sea kayak hulls, plastic or composite material. Fishing Kayaks No longer will you struggle to load your fishing kayak. K-RACK will take the effort out. Recreational KayaksNo matter the shape, the K-RACK is suitable for your recreational kayak or canoe. To find out how to use on your Hatchback/SUV see HERE. To find out how to use on your Sedan vehicle see HERE.